For online tee times visit: Online Tee Time! Embassy Suites Hotel Dorado del Mar Beach & Golf Resort. The 72 par, 18-hole golf course presents a breathtaking view of the ocean and the mountains as you play through a championship course fashioned by Chi Chi to bring out the best in your game and provide you with the kind of challenges that improve your play. Just what you would expect at one of Puerto Rico's premiere golf resorts and courses. 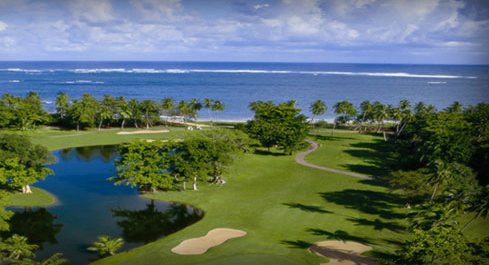 Dorado Del Mar Golf Club This golf course was designed under the expertise of world renowned Puerto Rican golfer, Chi Chi Rodriguez in 1998. 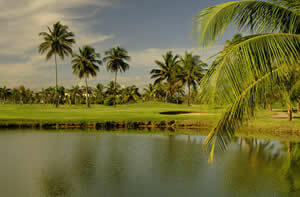 This 18-hole course is located in Dorado, just 20 miles west of San Juan. 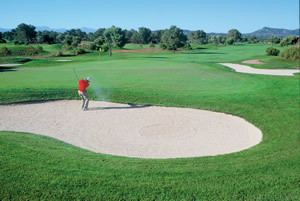 The course is characterized by its narrow fairways and magnificently shaped greens. It features 4 sets of tees, water on 12 holes and numerous bunkers. The signature hole is #10, a 525-yard, par 5, featuring stunning views of the Atlantic Ocean. 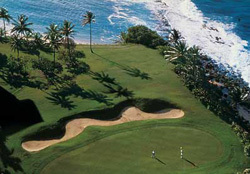 The tropical trade winds will test even the best players.At night, the course is lighted up for a night game. Green fees: 9 holes $85 and 18 holes $95.00.